Yesterday, on the website The Hayride, Tom Bonnette, the former Town Talk reporter, posted a hit piece against the Louisiana Budget Project and its founder Melissa Flournoy. I know Mr. Bonnette, and I know Ms. Flournoy. Mr. Bonnette is plain wrong. His post attacking the Louisiana Budget Project was, in my opinion, irresponsible, unprofessional, and sloppy reporting; it was reckless, bordering on the unethical. 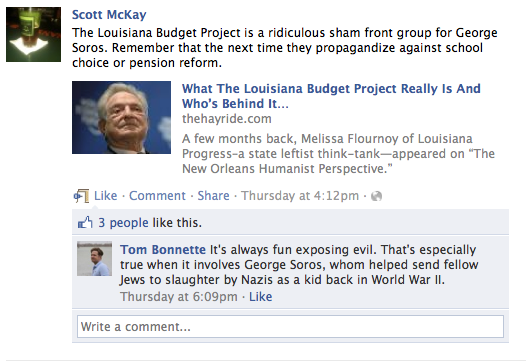 Instead of accomplishing what he apparently set out to do– “exposing” the Louisiana Budget Project as a nefarious and egregiously partisan organization (which it most certainly is not), Mr. Bonnette unwittingly exposes his own extremism and biases. With his references to conspiracies like the “new world order” and hackneyed, stupid tropes about the machinations of George Soros, Mr. Bonnette abandons any attempt to frame an objective, truth-seeking narrative and devolves into an almost paranoiac rant. And it’s a shame. From its inception, the Louisiana Budget Project has been upfront and transparent about its mission, its policy agenda, and its funders. There’s no great mystery here. Anyone with an Internet connection can find this out within ten seconds. No one is attempting to hide anything. Again, I know many of the folks behind the Louisiana Budget Project and Louisiana Progress, including Ms. Flournoy. Indeed, I actually contributed to The Louisiana Progress Journal. And the plain and simple truth is this: Mr. Bonnette misreported the story. This isn’t a “sham” organization that takes its orders from a boogeyman billionaire intent on ushering in “a new world order;” that is laughable, ridiculous, over-the-top. This is a non-profit organization dedicated to providing Louisiana-centric scholarship on Louisiana issues that uniquely affect working class families. Mr. Bonnette and the folks at The Hayride may not agree with them on substantive policy, and that is absolutely their right. But suggesting that they and dozens of other outstanding organizations all over the country are shams– without conducting an ounce of real research and relying entirely on the fact that a George Soros-backed non-profit organization gave them some funding (which has always been well-known to anyone paying attention)– is shoddy work, and with respect to Mr. Bonnette, it deserves to be called out. It’s also ironic: If conservatives want to lecture progressives on billionaires giving money to influence politics and policy, then they need to begin by taking a good, hard look in the mirror. The Koch brothers have used their wealth to fund political campaigns that advance economic policies which would make them even wealthier. Soros, on the other hand, has given away billions, all over the world, to help the less fortunate and to expose political and media hypocrisy. Mr. Bonnette mentions Media Matters as an example of Soros’s destructive influence; I think Media Matters is an incredibly valuable resource. In the past, I’ve called out and criticized two conservative organizations in Louisiana: The Pelican Institute for Public Policy and the Louisiana Family Forum. I criticized the Pelican Institute for holding itself up as Louisiana’s “first think tank,” when, in actuality, it was founded by a New Yorker, created- almost entirely- by out-of-state interests, and built on borrowed scholarship from national conservative think tanks. The Louisiana Budget Project and Louisiana Progress are none of those. And with respect to the Louisiana Family Forum, my criticism was not focused on their sources of funding (with the exception of a nationally-recognized hate group) but on the ways in which they transferred tax-deductible donations from their 501c3 to their political advocacy arm, a 501c4, allowing them to establish a campaign apparatus with tax-deductible money (I don’t know if this is illegal, but it most certainly seems unethical, considering that donations to their 501c4 would otherwise not be tax-deductible). I don’t have the proof, the hubris, or the belief that these conservative non-profits are engaging in some sort of new world order conspiracy; I think they’re guilty of misleading Louisiana. And again, that has never been the case with the Louisiana Budget Project or Louisiana Progress. You can disagree with their policy positions, but as non-profits, they’ve always been on the up-and-up, which shouldn’t be surprising when you consider that both were created by the founder and former President of the Louisiana Association of Non-Profit Organizations (LANO). Yeah. Ha. Ha. Ha. Nuclear weapon. Millions of innocent people dead. Parking lot for China. Americans burn the Koran, and we apologize! That’s the last straw! Sand turns into glass (Someone needs to tell David O’Connor that Afghanistan is not a desert). Seriously, this is disgusting, rancid, jingoistic bile, and Scott McKay hopes to capitalize off of his opinions on his website through people like Lt. Governor Jay Dardenne, whose campaign took out $900 in ads on The Hayride. Thankfully, Louisiana is fortunate to have some intelligent, compassionate, and ethical people who think deeply about policy, people like those involved in the Louisiana Budget Project and Louisiana Progress. Mr. Bonnette thinks he’s exposed “evil.” He thinks that George Soros, a Hungarian Jew, sent “fellow Jews to slaughter” when he was a child. And why? Because, as a kid, in order to survive, Soros told the Nazis he was a Christian. Mr. Bonnette’s comments, which mimic comments made by people like Ann Coulter and Glenn Beck, are nothing more than hate-mongering hyperbole. It turns my stomach: Blaming a Jewish child for sending “fellow Jews to slaughter” is an almost unfathomably loathsome remark, no matter how you land on the political spectrum. And attempting to connect this stupid conspiracy theory to the Louisiana Budget Project– to pat yourself on the back for “exposing evil”– borders on delusional narcissism. What kills me is these so-called journalist keep ignoring the fact that this entire pot of legislation is right out of the ALEC model bill guide. And if anyone doesn’t believe that, I’ve got a WestLaw search that came up with nearly identical bills across some 20 states. What about the money being poured into ALEC by those whose business plan includes more private prisons, more private schools and all of the building that goes on with that. The balance of money on the “good” side (Louisiana Progress, The Budget Project) is NOTHING compared to the balance of money on the “bad” side, if you will, whose interests are suspect at best. How disappointing coming from such an amiable guy like you, Lamar, to imply that I must be a delusional narcissist—or at least a borderline narcissist— because we disagree. I guess that’s kind of like a borderline diabetic? I better watch my ego intake. I would have expected someone who has been attacked on another blog as a “pinko gimp” and called names like “fetal Freddie” to steer clear of personal attacks, like implying that I have a psychological disorder. I have never approved of that kind of language when it has been directed at you, so I’m a little miffed to read them on CenLamar. If I call someone an “extreme leftist,” that’s not an insult. It’s something I can back up and it’s nothing personal. As for me, “unwittingly” exposing my “extremism and biases”—nothing of the kind. My political views are well documented. You can read them on The Hayride anytime you like and I have never made a pretense to be anything other than what I am—a good looking, humble freedom fighter. You can call me what you will for my political standings. I’m not nonbiased or objective. I try to be as honest as I can, but I come from a particular viewpoint that’s not hidden. Others, like Louisiana Budget, are not so honest. They shouldn’t try to cloak themselves as a nonbiased, objective fiscal policy analysts group when they are anything but that. They are exclusively financed by extreme leftists like Soros for a reason and I think that point should be driven home. There was no misreporting in the piece. Every bit of where their funding comes from is properly laid out and true. You are no journalist, Lamar, but you are a smart guy who knows the difference between a news reporting and an opinion piece. I believe Louisiana Budget Project to be a sham propaganda organization and I think intelligent people can look at the facts and see that they are. And you’re on Facebook trying to catch people in an “a-ha,” moment? Seriously? You are supposed to do that with your girlfriend, not other bloggers—that’s what Facebook is for. As for things I have written on Facebook, I stand behind them, as well. Soros was 14 years-old when he helped point out fellow Jews to the Nazis, who confiscated their property and slaughtered them. I wasn’t much older than that when I went off to fight a war. Looking back, Soros has said he feels no guilt. That’s evidenced by his support of Media Matters, another sham propaganda group that’s been repudiated by the likes of Alan Dershowitz—not really a conservative—for their anti-semitism. Soros, a billionaire hedge fund manager, has made his fortune betting on the collapse of foreign economies. He would now like to see the managed decline of the American dollar. He said that in the same interview that he talked about a “new world order”—his exact words— that needed to be created with China brought on board. No, I didn’t get that conspiracy stuff from Glenn Beck or Ann Coulter, but from the man himself. Evil? Yeah, I’m right on that one, as well. Have you ever seen a Bond film, Lamar? The accent should have been a dead give-away. You’ve got to wise up, man. Like I said, I’m disappointed. Hold on there, Tom. I know you, and I know you’re a nice guy. I was describing your rant, and if that is not clear, I apologize. I certainly do not believe you suffer from any psychological disorder, only that the rant itself and the description of Soros as a Nazi sympathizer borders on delusional narcissism. I stand by that. He was a child during World War II; I can only find one mainstream media report that mentions your claims– an interview he conducted on 60 Minutes– and I think your description is inaccurate and incomplete. I also think your reporting about the Louisiana Budget Project– the ways in which you couched it– was sloppy, not too professional, and a little paranoiac. I also stand by what I said about the Louisiana Budget Progress and Louisiana Progress. I think you’re grasping at straws here. Both groups have been transparent about their funders and their mission; there is no grand, nefarious conspiracy theory, no surreptitious cabal of Bond villans. You can only get so far by stringing together a series of tenuous “guilt-by-association” accusations before you have to confront the actual facts. 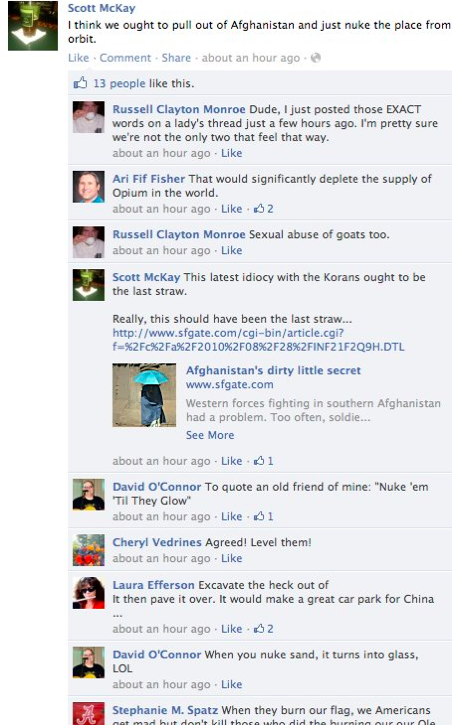 By the way, I did not scour Facebook to find these comments; indeed, they were posted on a public page. The first one was actually posted onto a large Facebook group page. I think they provide context to the political agenda of The Hayride. You obviously hold some strong opinions, but in my opinion, this was an absurd, kitchen sink attack. So, I am also disappointed. I appears that our disappointment is in synchrony If you ever make it back to Louisiana, what’s say we buy each other a beer at Finnegans Wake to cry in? Only we will have to take it outside to smoke….ah, still much I love about the old town but I’m glad I don’t live there anymore when I consider things like that. I guess I will have to rant all the louder to protect as many of our evaporating freedoms as I can. I’ll throw the kitchen sink (attack) at them if I have to. That’s a deal, Tom. The first round is on me.